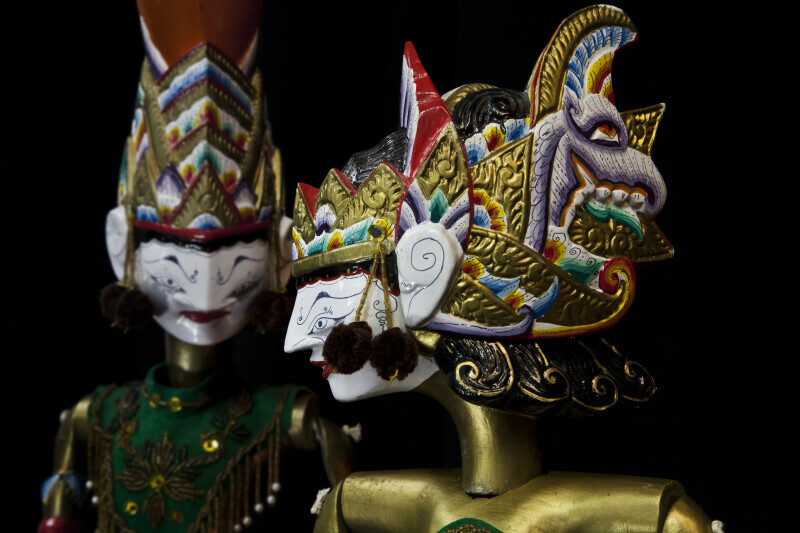 Wooden rod puppets (wayang golek) of Rama and Sita, from the Hindu legend called Ramayana (Sita is in the foreground). The Rama and Sita dolls are made entirely from wood and are wearing velvet sarongs embellished with beads, sequins, and gold applique. The heads and majestic crowns are three-dimensional, carved and hand painted. Both headpieces are painted in bright gold, white, red, yellow and purple. Their faces are white, with detailed facial features. They have tassels hanging on either side of their crowns. The figures are about 27 inches (69 cm) tall.